Christmas is a time for giving, caring and being in the warm company of family. Most Christmas specials and episodes reflect this uplifting spirit. “Ruldolph the Red-Nosed Reindeer” does everything but this, yet somehow I absolutely love it. “Rudolph the Red-Nosed Reindeer” is based on a novelty song written by Johnny Marks. 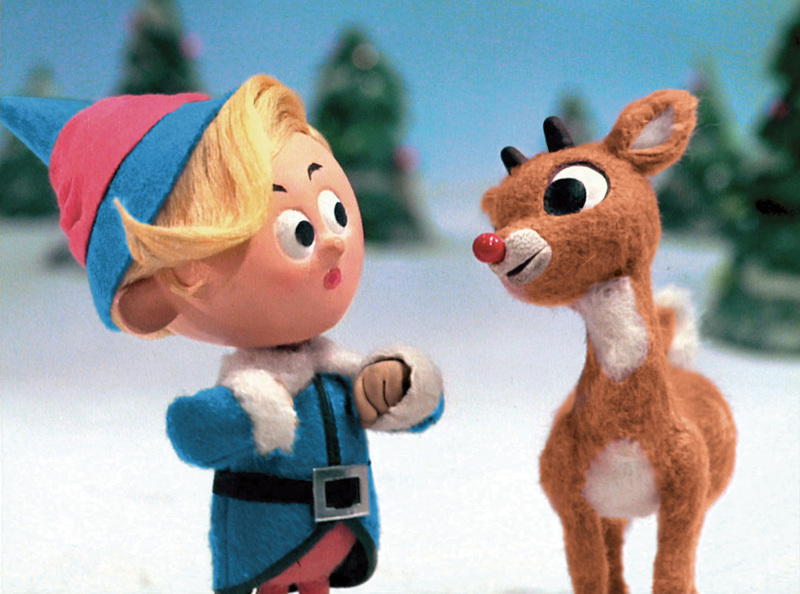 Despite the opening title-card Roman numeral stating that it was made in 1164 during the middle-ages, the truth is Rudolph was released on December 6, 1964 on NBC. It received such high ratings then that they have reaired it every year since. 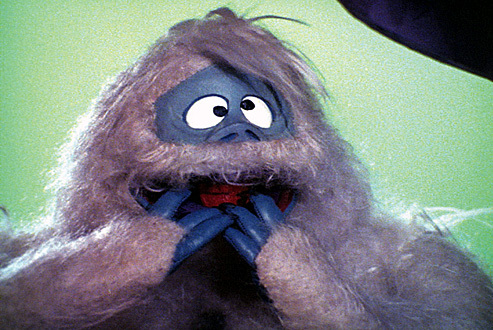 Rankin/Bass created this in the first of a long series of stop-motion animated Christmas-themed specials including the equally twisted and hilarious “Santa Claus is Comin’ to Town”. Right when Rudolph is born, Santa visits and discovers that he is a true freak of nature. His nose glows red (LIKE A LIGHTBULB!) which makes him different from the ideal-reindeer type that is reinforced by the society of the North Pole. Quickly, Rudolph’s father Donner, covers up his nose with some clay compound and decides to raise Rudolph like a normal reindeer. This plan goes to hell during the reindeer games (no relation to the Ben Affleck film). Rudolph is this close to making friends when he becomes infatuated with Clarice the doe who states he is cute. He becomes lovestruck, flies, wrestles his friend then his fake nose pops off. This causes everyone to make fun of Rudolph. Santa even tells Donner that he should be ashamed of himself for raising such a monstrosity. Clarice attempts to comfort Rudolph by singing the song “There’s Always Tomorrow For Dreams to Come True”. It is a touching song that encourages people to not seize the day and put off their aspirations until another day. A procrastinator’s anthem. The non-deer characters have their own problems as well. Mrs. Claus is fattening Santa, who is reluctant to return to an unhealthy body weight. Yukon Cornelius the ginger prospector uses small dogs to drive his sled towards his capitalist goals, even when they are tired. Hermey is an elf that wants to be a dentist and not make toys so shame on him. The event of the reindeer games leads Rudolph, Hermey and Yukon to meet with each other. They flee the abominable snow monster across the sea to The Island of Misfit Toys. To the keen observer, these toys are overall not defective. The Charlie in the Box illustrates the pickiness that many children have towards Christmas presents. The doll seems pretty normal, the elephant just needs a dye-job and the cowboy can easily be separated from the ostrich to make two normal toys. The toys retrieved and cared for by Aslan, I mean King Moonracer, whom Rudolph swears to that he will find a home for the misfit toys. In the conclusion that is now seen on television today, this happens in the grand finale. This was not the case in the original version where the toys do not get mentioned at all in the end, leaving them to a chilly, lonely fate. This of course caused parental outcry and NBC would later shoot the ending that we all know with their rescue. Included in this scene is that bird whose defect is that he cannot fly being dropped out of Santa’s sleigh without any safety gear. While Rudolph is off, the men set out to find him, leaving the women behind. Rudolph’s mom and Clarice decide to be strong and independent women and by doing so get immediately captured by the snow monster. Hermey removes the snow monsters teeth showing his aptitude as a dentist.. Although he saves his friends from being devoured, he removes the only possible client in the north since no one else has teeth. Yukon apparently dies throwing the monster over the cliff, but they survive! This allows Yukon, capitalism incarnate, to enslave the monster into putting the star up onto the tree. When Rudolph returns he discovers that Santa has cancelled Christmas due to weather. Because the children can receive no gifts, Christmas loses its function. This contrasts literally every other Christmas special ever. Christmas specials tend to promote the idea of community and togetherness. It is a time of the year to set aside grievances and for people to celebrate their love for one another. Sure, the gifts are fun to receive and give but Christmas does not come from the store, it means something a little more. Luckily for the children of this world, Rudolph uses his nose so he can be a navigator for Santa’s sleigh. No apologies are given to anyone for all the bullying, sexism, ostracism and enslavement but it is all okay because people can receive their presents. “Rudolph the Red-Nosed Reindeer” is deprived of morals, but that is part of what makes it fun to watch as an adult. The blend of nostalgia and the more mature ideas of what the true meaning of Christmas really is emerge through watching this classic. Even though I always deconstruct this well-meaning classic, I still thoroughly enjoy it every time I watch it. It is a staple for my Christmas season, and I know I will always watch it but never take its lessons to heart. There are currently No Comments on “Rudolph the Red-Nosed Reindeer”: A Morally Depraved Classic. Perhaps you would like to add one of your own?